I was going through my photos on Flickr today, as I ate my lunch, trying to put a bit more organization to them. I still have a ways to go to get through some 6,000 photos taken since 2009, but I made a bit of progress. I stumbled across this photo. Oh man. I remember this event. 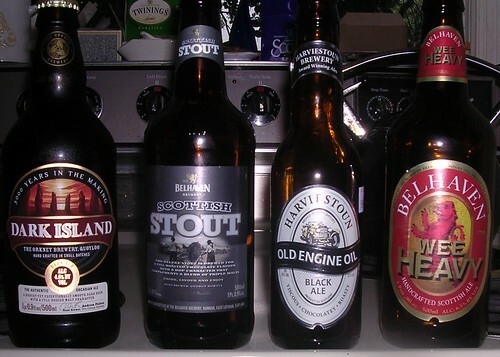 I went to the store and bought these beers, and a few others not shown, all of them of Scottish origin. Belhaven was, at the time, my favorite, but I'm thinking I wound up liking the Old Engine Oil best. I found the blog post which used this photo but it doesn't say how I liked Dark Island. I don't remember. Perhaps worst of all, I don't remember how any of these tasted. Now, mind you, life changes on you and what you once took for granted can be gone quickly. With rheumatoid arthritis drugs in my body, my liver cannot handle extra things like alcohol. I will, on extremely rare occasions, drink a teaspoon of something, but when the choice is RA drugs or a damaged liver, I'm going to choose the drugs. Still, I'm feeling nostalgic for the time I could look in the fridge and find a wide variety of Scottish beer. In 2012, there were times I'd be out for dinner and feel so awful about not being able to share a drink with friends. In 2016, I don't think twice about it. I've given away almost all the alcohol that was in my house. I have some unopened bottles of things in the basement. They are going this year. It's all about your perspective. Making this choice was easy for me, if the implementation was a bit hard. The photo represents a time in my life that was different. I'm happy with where things are now.